Growth of the population and its impact on economic development is a topic that has long attracted the attention of the experts to the economic and community issues. For many years, economists have come to believe that the factor that ultimately determines the nature and development of societies is the quantity and quality of human power or, in other words, human capital of that country. The effective use of human resources in the process of economic and social development is more than anything related to the level of knowledge, effort and creativity, which depends on the physical and mental health of the members. The main objective of this study is to investigate the impact of aging on regional and provincial economic growth. For this purpose we have applied the data from statistical center of Iran and the Central Bank in the specified time interval. The results of model estimation using data panel method during the period of 2011-2014 show that population aging has a negative effect on economic growth. According to the findings of this study, for each unit, the growth rate of the population over 65 years old will decrease to the total population by 0.000455 units of economic growth. Reduction of economic growth will reduce resources and facilities available to people and society as well as reduce the resources and facilities available for public sector and policy making, and will further reduce economic growth. 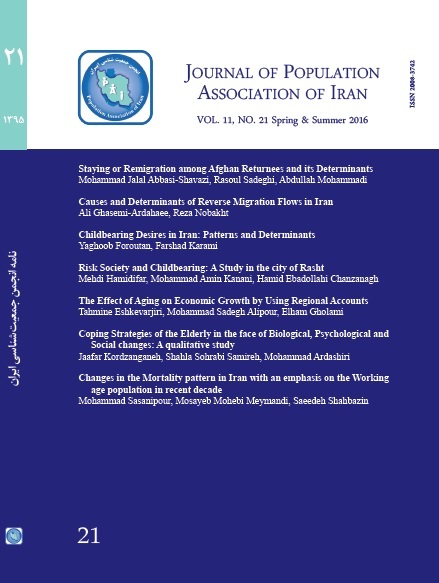 Journal of Population Association of Iran, 2018, 11(21): 138-155. Click here to get the paper.